To view our current inventory of antique Royal Navy campaign medals, uniforms and accoutrements, click here! This Very Rare Medal Has Been Sold. 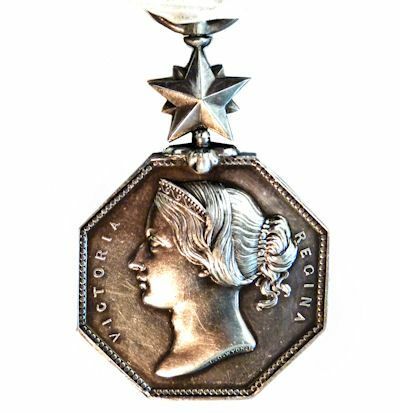 DESCRIPTION of this MEDAL: Octagonal shaped medal bearing the head of Queen Victoria on the obverse with the inscription 'VICTORIA REGINA' while the reverse depicts a three masted ice bound sailing ship within the polar region with a sledge party in the foreground. Above the ship are the words 'FOR ARCTIC DISCOVERIES' while the dates '1818-1855' appear in the exergue below. The suspender takes the form of a polar star with a metal ring attached on top to take the ribbon. Metal: Silver. Size: 46mm high and 33mm wide. Clasps: Non authorized for this medal. 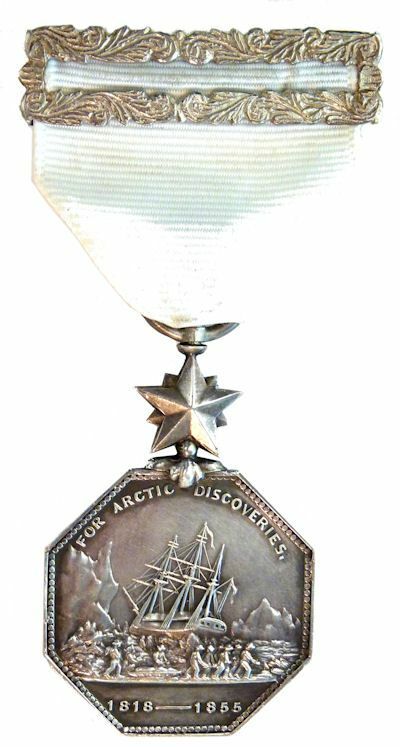 NAVAL GENERAL SERVICE MEDAL - ARCTIC: Instituted in 1857, this medal was awarded to some 1,486 recipients who took part in the various polar expeditions between 1818-56. Recipients included civilians, scientists, French and US naval personnel as well as 1,106 members of the Royal Navy. 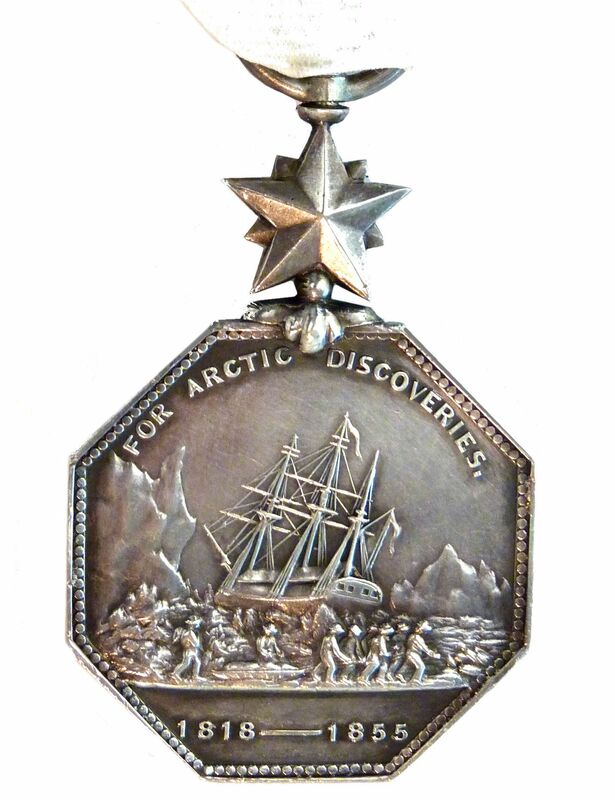 The British Arctic Medal is very rare and was unnamed when issued. It was awarded to all officers and men engaged in expeditions to the Polar Regions from 1818 to 1855. This included men involved in the on-going search for the ill-fated Franklin Expedition of 1845-48. 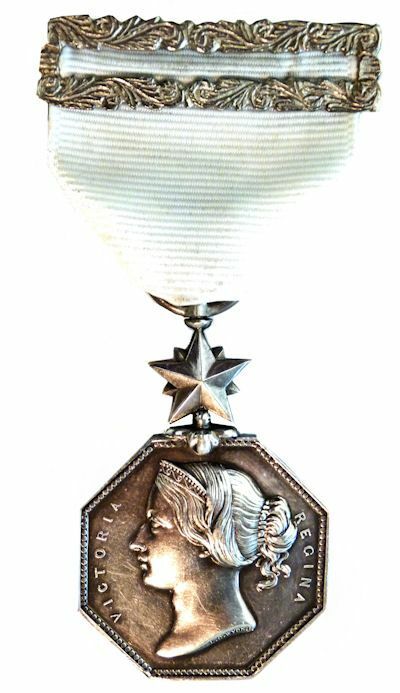 The medal was awarded to civilians, scientists, and personnel of the French and U.S. Navies and employees of The Hudson's Bay Company who took part in a number of abortive search parties for Sir John Franklin and his crew. Only 1,106 medals out of 1,486 in all were awarded to Officers and ratings of The Royal Navy.